One of the happiest moments of my life was coming upon this scene in Purple Rain. Just in case you have missed out on all essential American culture, it references this Abbott & Costello routine, arguably the most famous American comic routine. Leaving that for the moment, why did this make me so happy? Here were these guys who seemed to share little in common with me and yet clearly shared a love for great comedy. They had seen Abbott & Costello and liked them so much that they paid tribute at their first opportunity. I was young, but I had this creeping suspicion that people all around the world were just people and might possibly have more in common than reasons for disharmony. Frankly, if we could laugh together, then there would always be hope. We spend a great deal of time worrying about artists who highlight contemporary issues while spending a lot of time forgetting that these same artists eventually become elder statesmen that future generations may well revere. Issues disappear while creativity and energy survive. For whatever reasons, my childhood was blessed by one local television station with an irregular Abbott & Costello movie on weekend afternoons. I think it happened between football and baseball seasons. After all, the weather was poor enough to justify flopping down on the sofa. I did not know then how perfectly Bud Abbott and Lou Costello captured the model of the comic duo: straight man and funny guy; tall and short; clever and dim; thin and fat; verbal and physical. I did not appreciate the work and creativity that went into their finest pieces of work. I only knew that they made me laugh uncontrollably. Nowadays, I appreciate all those qualities and still they make me laugh. They were huge stars for a brief time, which seems unimaginable today. Then again, a roll call of golden age stars presents some pretty unusual silhouettes. I find it difficult to call any of their films a classic. 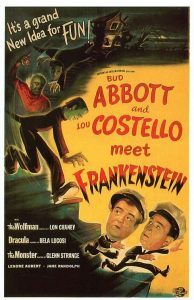 Abbott and Costello Meet Frankenstein comes the closest. Like people who quote Monty Python movies, fans tend to remember the gags more than the plots or the film-making. Perhaps that is as it should be. Whether or not critics treat comedy the same as more serious pursuits, those involved behind the scenes making the films tend to be most focused on capturing whatever is going on in front of the camera, knowing full well that the comedians are the reason for their creation. The best directors and screenwriters must be aware that they are going to receive less credit than their dramatic counterparts. This probably explains how surprised people were to learn that some of Groucho’s best “ad-libs” had been written for him ahead of time. Ultimately, I think Abbott & Costello found a direct line to our inner child, the one who cannot quite believe what he is seeing and hearing. They are our internal dialogue when we face life’s little (and large) challenges. Because of them, we can glance at one another and share a smile. You’ve Got to Check This Out is a blog series about music, words, and all sorts of artistic matters. It started with an explanation. 222 more to go.